I find car seats generally quite overwhelming. Heading into a showroom is probably your best bet because online it's somewhat impossible to distinguish between them all, what is good and what isn't. I often rely on other bloggers honest opinions to gauge whether a seat is 'the one' for us. There are certain things that win me over and intrigue me from the onset, we previously (and still do have in my Dads car now) the Maxi - Cosi Pearl, it was great and did the job, initially luring me in with the recline feature though Noah quickly grew too big for it and after forking out almost £400 for both the seat and base it seemed ludicrous. I felt a little robbed. 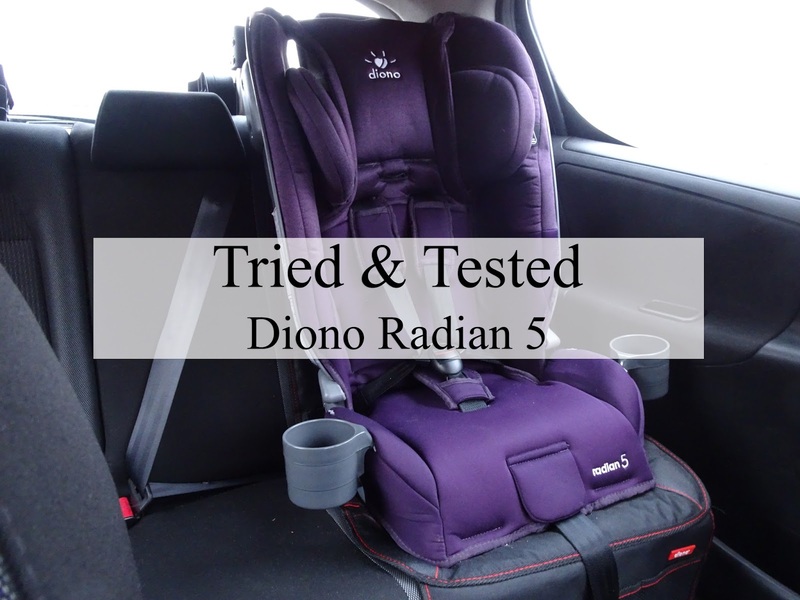 Diono however, recently reached out and asked me if I would like to review their Radian 5 car seat, and I have to say I was very excited when I took an initial glance to see 'All in one, from birth to 25kg'. Amazing. Car seats are seriously expensive things, we were on the market to purchase another for Noah before receiving our Radian 5, and that would have been our third seat for him, with each other him probably almost ready to burst out of before we'd reluctantly bought the next stage. I always wondered why there wasn't just one simple seat that could do it all - thank god for Diono right? The Radian 5 is very swish in that it can be both rearwards and forward racing, lots of memory foam padding and can house up to four cup / snack holders. Great for those long journeys. If I'm completely honest John did struggle slightly with installing the car seat, but this is a guy who almost always has some kind of problem with any kind of DIY project. It once took six hours to put up a basic shelf - Sorry John but it's true. Diono do provide a seriously in-depth and helpful guide, though not all of it is entirely useful to you dependant on what stage you're having the seat at. Of course compared to our old click in ISOFIX, it seemed to be a much more laborious process, however isofix car seats cannot hold the weight a seat belt car seat can, so personally I think the extra time installing is worth it for the money you're going to save getting longer use from the Radian 5. My advice would be to check out their installation videos on their website, it was so much easier to have a step by step guide to look at and follow along, doing such ensured before long we had the seat installed to house our little Noah. Comfort wise for me the Radian 5 ticks all the boxes, I knew as soon as I slid it out of the box that it was plush and soft, exactly what you want to rest a tired toddlers head. The Diono wins quite a few prizes for the cup holders, I'm more than aware it's just a cup holder but this can buy you valuable moan-free time on a long journey if there is somewhere for them to house a drink, snacks and perhaps even some toys or colouring pens. A simple concept yet something so many other car seats fail to offer. For us, Noah faces forward, just due to the fact the new laws didn't come into place until he had already began facing forwards and I fear now moving him rearward would spark a row bigger than Brexit, something as a Mum of two I don't have the energy for. However, with Patrick we intend to keep him rearward for as long as possible, it just makes sense with the new laws in place now and he shall know no different. This means, we will be able to take full advantage of the extended rearward facing option - again something I've seen no other car seat offer. Most allow rearward till around 4, but with the Radian 5 you're looking till at least 6 before you have to consider switching them forwards. A real bonus for the safety conscious amongst us. Overall I'm really impressed with the Radian 5, it's a slimline design that doesn't compromise on comfort, allowing maximum safety for as long as possible. I can't really ask more from a car seat. I really don't like car seat shopping either - it's a mine field! Love how streamline this seat is - our current car seat seems to take up most of the back seat!! Oooh this sounds like a really good car seat I love my all in one car seat I am glad that means that we only need a couple of car seats. I sometimes wish we had never turned Jess around because I fear something bad was going to happen but she seems so much happier now she can see thing. I also love how Noah is rocking the purple car seat. Oh I love the colour. I know it's not as high on the priority list as safety but it's soo pretty! Thank the lord I do not drive, I hear car seats are a pain to hunt for in finding the right one for our little sprigs. But this must be one of the best I've seen and I love your honest review.